With contributions from Kath Robinson, Anne Slater,​ Roy Thwaite, Ian Thwaite, tom mills & Ann Heath. ​One of the fascinating things about the genealogy of the Liverpool Cowkeepers is the number of inter-family connections through marriage. It was quite a common occurrence for the offspring of cowkeepers to marry within the cowkeeping community; after all, they were moving and mixing in the same circles – usually cattle shows or meetings of the Liverpool & District Cowkeepers’ Association. The main thread for this article is the family tree of Kath Robinson, who is descended from the Nelson line. Through the generations many members of the Nelson clan kept cows in Liverpool, at various locations around the city. But, when you add in the dairies of their in-laws, a full-blown cowkeeping dynasty begins to emerge. I dare say there are more branches to this network than are covered here – should you have information about any more, do drop me a line. This dynasty takes in nearly 50 cowkeeping properties in Liverpool, some of which are still standing today. It also illustrates quite nicely the various familial to-ings and fro-ings that were taking place between the city milkhouses and the farms back in the dales – so typical of the cowkeeping way of life. James Nelson (1812-1895) married Margaret Sedgwick (1813-1885) in Dent, in 1834. They lived at Greenwood Haw, where James farmed 26 acres. They went on to have fourteen children. The Nelson cowkeeping dynasty in Liverpool is descended from two of these fourteen children: George and Agnes. George remained in the Sedbergh area, but a number of his children relocated to Liverpool. Whereas, his younger sister, Agnes, undertook that relocation herself and her children were born in the city. In June 1868, George married JANE GREENWOOD (1850-1926), in Dent. Jane was one of eight children of FAWCETT GREENWOOD and Ann Whitfield. Her sister, Dorothy (1843-1884) married JOHN HARPER and they relocated to Liverpool, as did John’s brother, ROLAND HARPER. George and Jane had ten children, all born in and around Sedbergh. Of these, six would move to Liverpool to keep cows: James, Fawcett Greenwood, Ann, Mary Jane, Elizabeth and Joseph Edward. JAMES NELSON (1868-1936) married AGNES DINSDALE (1866-1829) in the October of 1888, in Sedbergh. By the time of the 1901 census they were living in Liverpool and keeping cows at 31 BROADGREEN ROAD. Living with them were their children – Jane (11), Mary E. (9), Margaret A. (6) and George J. (4) – and James’s 17-year-old sister, Elizabeth, who was working as a domestic servant. All members of the family gave ‘Sedbergh’ as their place of birth. It seems the family’s stay in Liverpool was relatively short-lived as by the time their final child, WILLIAM DINSDALE NELSON, was born, in March 1904, they were once again farming near Sedbergh. Despite this, their youngest son, William, also became a Liverpool Cowkeeper and is recorded in the 1938 Kelly’s Directory as living at 50 SUTTON STREET. He had married PHYLLIS HARPER (1904-1992) ten years previously, in Sedbergh. FAWCETT GREENWOOD NELSON (1870-1918) married FRANCES (Fanny) TENNANT in October 1900; both were born near Sedbergh, but they married in Liverpool. A year later they were keeping cows at 1 NEWCOMBE STREET, Anfield. Living with them was Frances’s younger sister, Margaret (14). By 1911 they had relocated their business to 40 CORONATION ROAD, Crosby, where they were living with their nine-year old son, George. In November 1912, Frances’s sister, Margaret, married cowkeeper MICHAEL HARPER; at the time he was living at 65 Clifton Road East. ANN NELSON (1879-1929) married WILLIAM METCALFE (1876-1942) in April 1904, in Liverpool. Previous to this, in 1901, William had been working as a cowkeeper for his brother-in-law, RICHARD McLEOD at 6 LAITH STREET, Everton. The couple went on to have five children, all born in Liverpool: Jane, George William, Elizabeth, Mary and Annie. By the time of the 1911 census, the family were keeping cows at 2 VICAR ROAD. Ann died in 1929 and her body was returned to Sedbergh for burial. Four years later, William remarried and moved to 142 ST DOMINGO VALE, where he ran a dairy with his second wife, Elizabeth Gibson. The business at 2 Vicar Road was taken over by William’s youngest daughter, Annie, and her husband THOMAS ANDREW HARPER (1906-1986). Thomas Andrew was one of five children of David Henry Harper and Janet Lockie. Metcalfe’s Dairy became Harper’s Dairy and Annie and Thomas Andrew spent the rest of their lives at Vicar Road. MARY JANE NELSON (1881-1968) married JAMES CHAPMAN (1880-1929) in April 1906, in Liverpool. 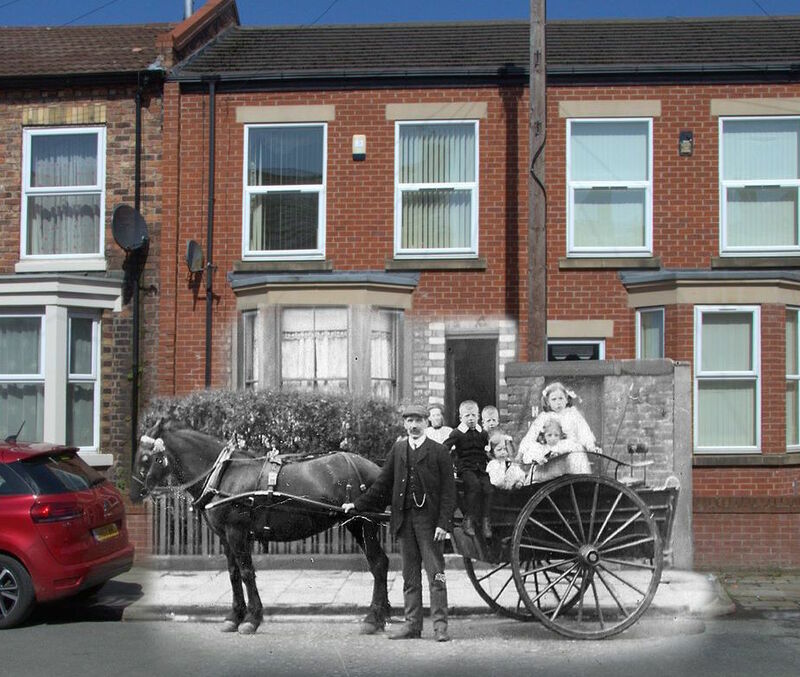 Previous to this (1901) Mary Jane had been living at 39 LOWER BRECK ROAD, working for cowkeeper JOHN J CLOSE of Cautley. By 1911 they were living at 25 WARBRECK MOOR, Aintree, with their children Margaret (3) and George Nelson (2). James’s occupation is given as Cowkeeper/Dairyman. ELIZABETH ALICE NELSON (1883-1930) moved to Liverpool to work for her brother, James, at 31 BROADGREEN ROAD (1901). In July 1906, she married RICHARD FAWCETT (1883-1963). Richard was the son of WILLIAM FAWCETT and MARGARET SEDGWICK. The 1911 census has the couple living at 8 COWL STREET, Everton, along with their children: William (3), Margaret (2) and George (4 months). Richard’s occupation is given as Cowkeeper. Although Elizabeth passed away in 1930, Richard was still at Cowl Street in 1938, but he is recorded in the 1955 directory as running a dairy at 8 ATTWOOD STREET. JOSEPH EDWARD NELSON (1887-1954) had moved to Liverpool by April 1910, when he married Edith Alice Moore. A year later they were living at 24 Whitman street, Wavertree. However, it is unlikely that he was keeping cows on these premises, as the house is a mid-terrace property with no discernable accommodation for cattle. Indeed, his occupation is given as ‘Cowman’ suggesting he was in the employment of a local Cowkeeper. George’s younger sister, Agnes, married EDWARD CAPSTICK (1854-1933) in October 1875, in Garsdale. Although Edward had spent most of his life farming in and around Garsdale, he had been born in Liverpool. When Edward’s mother, Mary (nee Dent) married his father, JAMES CAPSTICK, she was a widow. 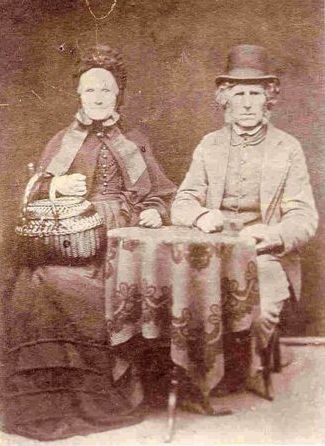 She had previously been married to THOMAS HARPER (1811-1851). Mary and Thomas had moved to Liverpool and at the time of Thomas’s death, in 1851, they were living with their four children and keeping cows at 18 ROSCOE STREET. A year later, Mary married James Capstick. He moved in with her at Roscoe Street and their first two children, Rose (b. 1853) and Edward (b. 1854) were both born there. But, by the time their third child, Isabella, was born in 1857, the family had moved back to Garsdale. ​So, it was perhaps no surprise that, once married, Edward returned to Liverpool to make a living as a cowkeeper. He and Agnes went on to have seven children: James (b. 1876, Sedbergh); Mary (b. 1878, Sedbergh); Margaret (b. 1880, Liverpool); Rose (b. 1887, Gargrave); Edward (b. 1890, Liverpool); James (b. 1892, Liverpool); and, Alice (b. 1893, Liverpool). In 1881 the family were living and keeping cows at 38 COLERIDGE STREET, off Kensington. But, by 1891, they had moved out of the city centre and were keeping cows at 1 NEILSON ROAD, St Michael-in-the-Hamlet, off Aigburth Road. At the time of the census, they were being visited by JOHN HARPER. ​Later that year the family experienced the trauma of losing their son, James (the elder), who was just 14 years of age. ​By 1901, the family had moved to the Garston end of Aigburth Road. Their address at that time is given as 27 AIGBURTH ROAD, but this was before the construction of the dual carriageway and subsequent re-numbering of the properties from the Garston end. Edward was farming at VALLEY FIELDS FARM & DAIRY. On January 1908, both of the Capstick’s elder daughters, Mary and Margaret, were married at St Anne’s Church, Aigburth. Margaret married JOHN CREIGHTON DUGDALE (1881-1961). 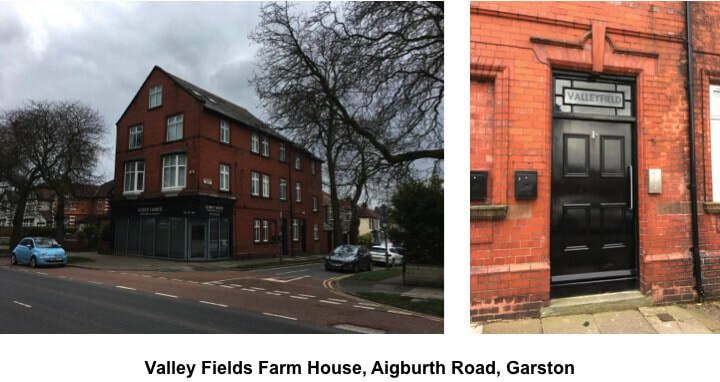 John’s occupation is given as Dairyman and he was living at Bridge Street, Mossley Hill. Although John had been born in Garsdale, his family had also moved to Liverpool. When his father, JOSHUA DUGDALE, died, in 1900, the family were living at 4 MARLBOROUGH ROAD. After that, John’s mother, ANN ELLEN DUGDALE (nee IRELAND), continued to run the dairy business, assisted by John and his siblings. ​After they were married, Margaret and John set up their own cowkeeping business at 1 GREAT GEORGES ROAD, Waterloo. In 1911 they were being assisted in the business by 32-year old widow, Mary Rowlands, and by 19-year old JOHN NELSON. 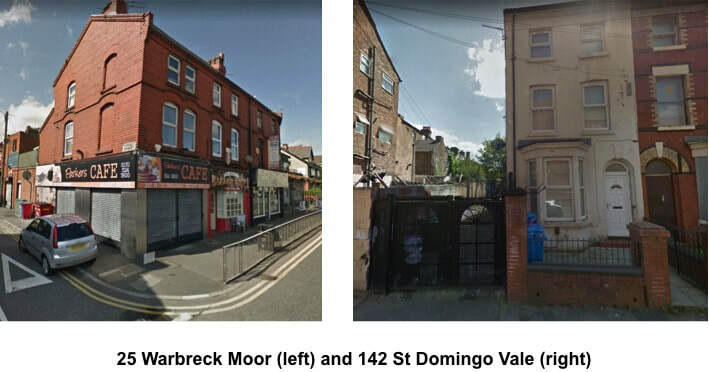 By 1911, Agnes and Edward had also moved their business to Waterloo – they were living at 42 HANDFIELD ROAD, just a short walk away from Great Georges Road. On the day of the census, Edward was away visiting his daughter, Mary. She had married Francis Croft and the couple were farming at East Witton, Middleham. Agnes was left holding the fort, assisted by her children: Rose, Edward and James (the younger), who were now all in their twenties. She also had the pleasure of the company of her 3-year-old grandson, Joshua Creighton Dugdale. Although Agnes and Edward spent the rest of their lives in Liverpool, they were both buried in Garsdale. Dorothy Greenwood (1843-1884) was Jane Greenwood’s sister. She married JOHN HARPER in 1862, in Sedbergh. John was one of five children of RICHARD HARPER (b.1815) and BETTY CAPSTICK (b. 1819). John, his brother, Rowland, and his sister, Rosamond, would all move to Liverpool to become cowkeepers, though John did not relocate until after his wife’s death. John and Dorothy had five children, all born in or around Sedbergh: Richard, Elizabeth, Fawcett, Annie and Mary. They were farming at Sunny Side, Frostrow, when, in 1884, Dorothy passed away. Then, by the time of the 1891 census John was keeping cows at 32 WITHERS STREET where he was living with his children: Elizabeth, Fawcett, Ann and Mary. Also in Liverpool at the time of the 1891 census was their eldest son, RICHARD HARPER (1862-1942). He had married AGNES THWAITE (1867-1960) in 1887, in Sedbergh, and had moved to Liverpool a year later. Richard and Agnes were keeping cows at 53 ANNERLEY STREET. The first six of their nine children were all born in Liverpool, between 1888 and 1898, before the family returned to Sedbergh. Their younger son, FAWCETT HARPER (1869-1944) married ISABELLA ELEANOR RAW (1873-1936) in August 1894, at St James’ Church, Liverpool. Isabella was the daughter of ROBERT RAW, also a cowkeeper. They had five children: Lily May, Dora Eleanor, Bessie Gladys, John Fawcett and Elizabeth Isabel. Over the years, they kept cows at a number of locations: 32 WITHERS STREET (1891), 104 BERKERLEY STREET (1901) and 52 CHESTNUT GROVE (1911). Their son, JOHN FAWCETT HARPER (1901-1987) eventually took over the business at Chestnut Grove. Rosamond married WILLIAM HENRY ELLIS (1838-1894) in October 1868, in Sedbergh. They had eight sons before they moved to Liverpool. In 1891 they were keeping cows at 104 BERKERLEY STREET, assisted by their sons, Henry (20) and Richard (19) and also by their stepdaughter, Elizabeth Harper (24). William passed away not long after that, in April 1894, and the property was eventually taken over by Rosamond’s nephew, Fawcett Harper (1901). Rowland Harper married SARAH J MASON (1867-1937) in 1887, in Sedbergh. They had eight children, all born in Liverpool between 1891 and 1910. In 1891 the family were living at 61a HIGH STREET, Wavertree. There was enough land at this location for Rowland to call himself a ‘Farmer’. However, by 1901 they had moved round the corner to 52 CHESTNUT GROVE and his occupation was then given as ‘Cowkeeper’. They returned to Sedbergh with their children in 1911 to farm at Dove Cote Gyll, Dowbiggin. The youngest of their three sons, EDWARD HARPER (1899-1986), married Doris Stockdale in 1924 and then returned to Liverpool in 1935. 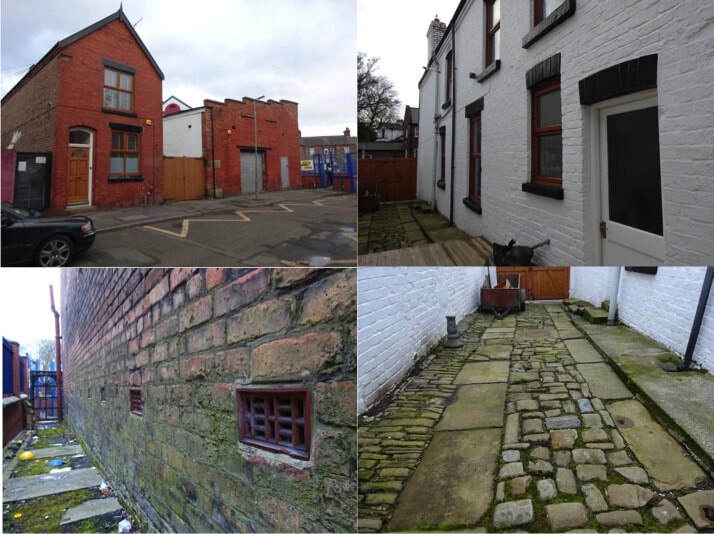 He took over a purpose-built cowhouse and dairy in Rose Lane, Mossley Hill, which he bought from Robert Wilson. Edward kept cows there until 1954 and the family continued to deliver milk right up until the late 1990s. Incorporated into the premises at Rose Lane was a 2-up-2-down cottage designed to house an employee - a cowman - and his family. For a while this cottage was occupied by JOE CAPSTICK, until 1944 when he relocated to run his own dairy at 4 MARLBOROUGH ROAD in Tuebrook. "The dairy premises formed a triangle of buildings to the rear of 53 Annerley Street." ​The property at 53 Annerley Street was important in the cowkeeping businesses of both the Harper and the Thwaite families. Although the building is no longer standing, it can be found on archive street maps of the area. Tom Mills’s recollections of his childhood years spent working there, give an idea of the layout of the premises and how it was used. “As a boy my family lived at 18 Spofforth Road, Edge Hill, and I attended St. Hugh's School. In Annerley Street there was a dairy run by Billy Thwaite, who was a friend of my dad. I used to visit this dairy with my dad and I always pestered Billy Thwaite to let me work there. Eventually, I wore him down and he relented. My role there was to collect eggs, help with bottling and to make sure the cattle always had water to drink. Being there was a high point in my youth. I was working there in 1959, when Mario Lanza died. The Thwaites are related to the Harpers through the marriage of Richard Harper and Agnes Thwaite (see above). Agnes was one of ten children of SIMON THWAITE (1840-1882) and MARY HOLME (1843-1915), who farmed near Garsdale. In addition to Agnes, five of their other children relocated to (or, had connections with) Liverpool: Hannah, John, Bessie, Richard, Holme and Rose Mary. Hannah married Robert Webster (1861-1906) in November 1885, in Aysgarth. A number of their children relocated to Liverpool, including MATTHEW HESELTINE WEBSTER (1891-1939), who kept cows at 75/77 WRAYBURN STREET. Hannah was in Liverpool when she passed away in 1932. John married LOUISA ALICE HIGSON (1862-1937) in 1889, in Settle. He spent most of his early working life as a railway signalman. However, by 1901 he was keeping cows in Liverpool at 31 SMITHDOWN ROAD, where he was living with his wife and three children. By 1911, the family had moved to the nearby 35 SMITHDOWN ROAD. John’s eldest son, SIMON THWAITE (1892-1971), continued in the cowkeeping trade and was running his own business from 26 GREY STREET when he married Janet Rose Pover, in 1916. Although John died in 1917, it seems that his wife, Louisa Alice, continued running the business as she is listed in the 1939 phone book as ‘L. 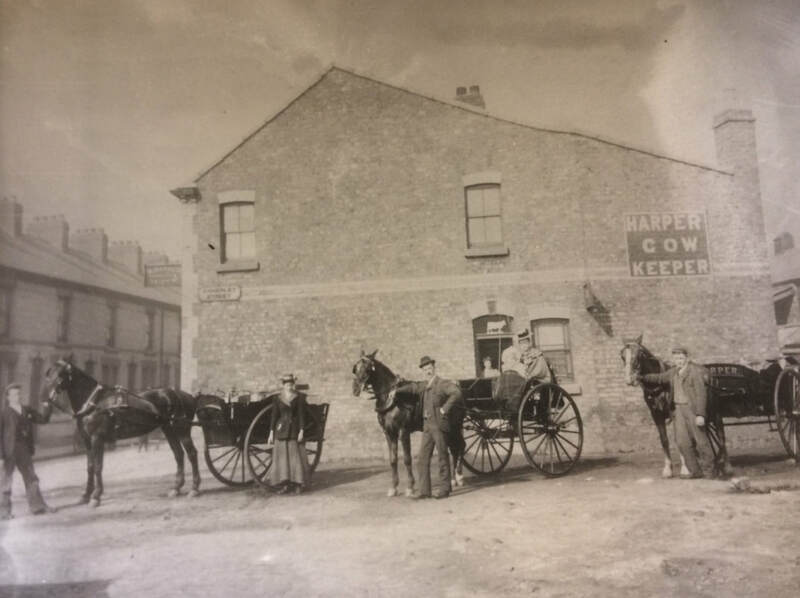 A. THWAITE & SON – COWKEEPER’, trading from ‘GARSDALE’, MILL LANE, Wavertree. In 1891, Bessie was living with Agnes (her sister) and Richard Harper, working in the dairy at 53 ANNERLEY STREET. However, in 1898, she married THOMAS SUNTER (1872-1909). Thomas was a cowkeeper at 123 and 125-127 PARK HILL ROAD (1891), but by 1901 he and Betsy were keeping cows at 96 SELBORNE STREET. Although Thomas died in 1909, Bessie continued to run the business in her own name (1911). In 1939 she is recorded as a Cowkeeper/Dairy at 98 SELBORNE STREET with her sons Thomas Sunter, Cowman and Roundsman and Harold Sunter, Cowman and poultry Farmer. Bessie died in 1944 but two of her sons continued and are recorded in the 1964 directory: Harold & Jn. H. Sunter. Dairymen. 96-98 SELBORNE STREET. It may well have been Richard inheriting £100 from his grandmother that funded his cowkeeping business in Liverpool. In 1900 he married Minnie Hughes and took over the dairy at 53 ANNERLEY STREET that had previously been run by his sister Agnes and her husband Richard Harper. All eight of their children were born at this address and both Richard and Minnie lived there until the end of their days. Two of their sons, Simon and Richard, continued with cowkeeping businesses of their own, once they had left the family home. SIMON THWAITE (1900-1974) married HANNAH SUNTER GREENWOOD (1902-1979) in 1924. Hannah was the daughter of FAWCETT EDWARD GREENWOOD (1876-1932) who had kept cows at 75/77 HEATH STREET. In 1932, Simon’s younger brother, RICHARD THWAITE (1904-1975), married Hilda Mary Page and they had a dairy at 36 GRETA STREET. The Richard Batty Memorial Cup for the best pair of dairy cows. The Robert Raw Cup for the champion dairy cow. The Metcalfe Challenge Cup for the best pair of cows (one dairy cow and one fat cow belonging to the same exhibitor). The Batty Silver Cup for the best lightweight cow. The Metcalfe Challenge Shield for the best heavyweight cow. Talking to the Echo to-day, Mr Thwaite modestly passed most of the credit on to his herdsman, Mr J. Higgins, of 13 Beckenham Avenue, adding: "The herds maintained by Liverpool cowkeepers are second to none. No herds are more keenly supervised and none have a better record." Yet, two other of Richard and Minnie's sons retained their connection with the dairy at Annerley Street. In 1935, THOMAS SUNTER THWAITE (1914-1996) married FLORENCE SPRAINGER (1914-2008) and by 1939 they were living just around the corner from Annerley Street, at 157a Earle Road - Thomas's occupation is given as 'Cowman and Roundsman'. (It is probably no coincidence that, living a few doors away, at 151a Earle Road, was Florence's brother, John, whose occupation is also given as 'Cowman'.) And, it seems the youngest son, WILLIAM HAROLD THWAITE (1917-1989) stayed at home, after he married ANNIE BYROM (1918-2008), in 1939. Tom Mills recalls working at the dairy as a lad, in 1959 – it was then owned by ‘Billy Thwaite’. In 1900, Holme married Margaret Bell (1875-1933) and between 1902 and 1910, they had five children. 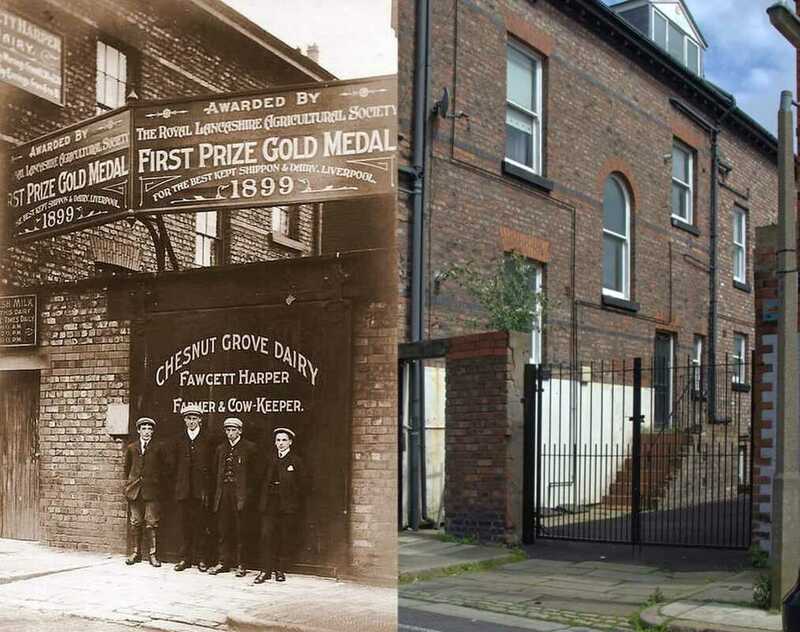 They kept cows at 248 PICTON ROAD (1901), at 12 CREDWORTH STREET (1911) and then at 16 LINDLEY STREET (1933). Margaret died in 1933 and five years later, Holme married Mary Joynson (1909-1987). He opened a dairy at 302 SMITHDOWN ROAD, where he had three more children with Mary. Rose Mary’s involvement with cowkeeping was fleeting. In 1901, she was living with her sister, Bessie, and brother-in-law, Thomas Sunter, at their dairy in Selborne Street. In 1908, she married railway labourer, Albert Ernest Payne. 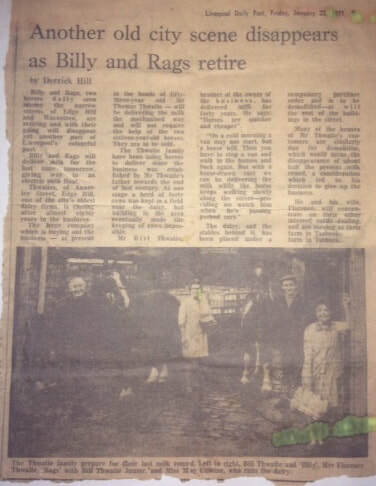 Billy and Rags, two horses daily seen among the narrow streets of Edge Hill and Wavertree, are retiring and with their going will disappear yet another part of Liverpool’s colourful past. Billy and Rags will deliver milk for the last time tomorrow, giving way to an electric milk float. Thwaites, of Annerley Street, Edge Hill, one of the city’s oldest dairy firms, is closing after almost eighty years in the business. The large company which is buying out the business – at present in the hands of fifty-three-year-old Mr Thomas Thwaite – will be delivering the milk the mechanised way and will not require the help of the two sixteen-year-old horses. They are to be sold. 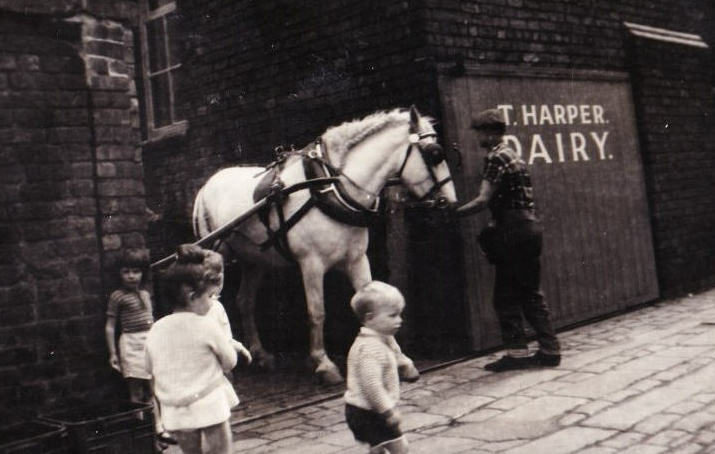 The Thwaite family have been using horses to deliver since the business was established by Mr Thwaite’s father towards the end of the last century. At one stage a herd of forty cows was kept in a field near the dairy, but building in the area eventually made the keeping of cows impossible. The dairy, and the stables behind it, has been placed under a compulsory purchase order and is to be demolished – as will the rest of the buildings in the street. Many of the houses of Mr Thwaite’s customers are similarly due for demolition, which would mean the disappearance of about half the present milk round, a consideration which led to his decision to give up the business. He and his wife, Florence, will concentrate on their other interest, cattle dealing, and are moving to their farm in Hale. The Sedgwicks are related to the Nelsons through the marriage of Elizabeth Alice Nelson and Richard Fawcett - Richard was the son of WILLIAM FAWCETT (1850-1911) and MARGARET SEDGWICK (b. 1850). William and Margaret married in 1874, in Dent, where William was a farmer. They had moved to Liverpool by the time of the 1891 census, when they were keeping cows at 23-25 ROTHWELL STREET. Although still at Rothwell Street in 1901, by the time William passed away, in 1911, they had moved to 39 LOTHAIR ROAD. Following the death of her husband, Margaret continued to run the business in Lothair Road (M. FAWCETT, Cowkeeper), assisted by her children: William, Elizabeth and Isabella. Margaret was one of seven children of WILLIAM SEDGWICK (1818-1895) and AGNES (Nanny) DENT (1818-1866). 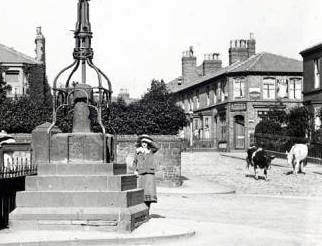 She was born in Sedbergh, but spent the early part of her life in Liverpool as, at the time of the 1851 census, the family were keeping cows in at 4 LOW HILL. Although, by 1861, the family had returned to the Sedbergh area to farm, this relatively brief stay in the city, not only had an influence on Margaret, but also on her siblings, as the Liverpool connection was maintained by a number of them: Agnes, Isabella, Mary and Richard. Agnes/Nanny married EDMUND FAWCETT (1830-1902) in 1860, in Dent. Two of their daughters eventually became involved in cowkeeping in Liverpool. Their daughter, Agnes, moved to Liverpool to work for her uncle, Richard Sedgwick, at his dairy in Reynolds Street (1891). While living there she met and married Richard Harvey; the couple subsequently moved to Preston. Their other daughter, ELIZABETH FAWCETT (b. 1871), married JAMES BURTON (b. 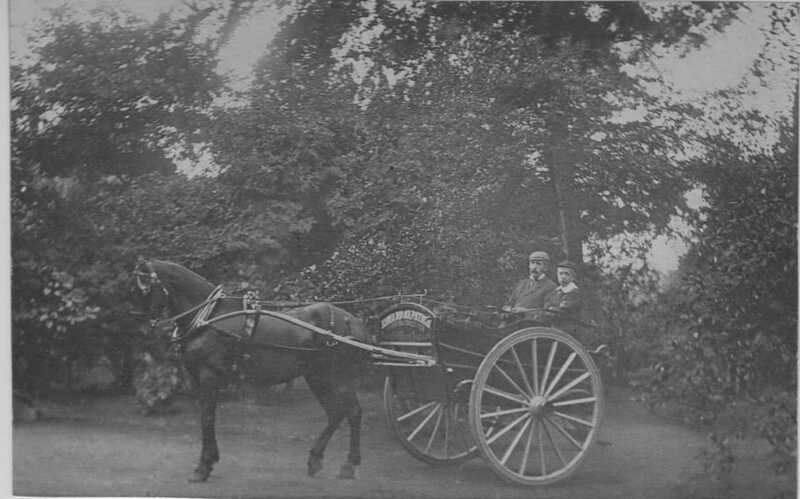 1872), in 1896, in Sedbergh. 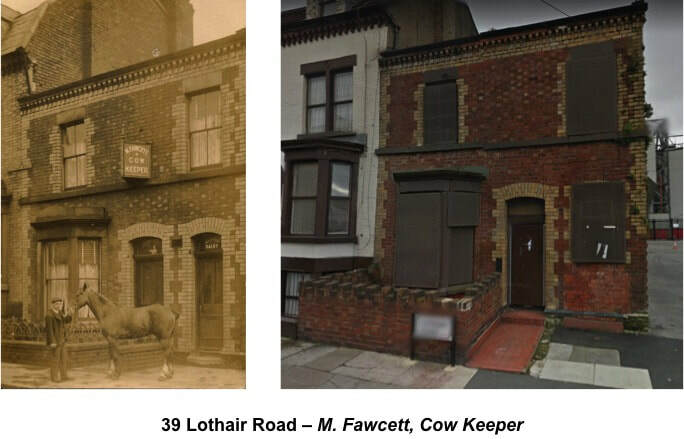 They went on to keep cows in Liverpool at 6 OAKFIELD ROAD (1901 and 1911). Their children, Isabel and James Fawcett, were both born at the Oakfield Road premises. At the time of the 1911 census, Florence Ann Fawcett was visiting the family. Isabella married ANTHONY ASKEW (1841-1905) in 1860, in Dent. They were both very young when they married: Isabella, just sixteen and Anthony, nineteen. To begin with, Anthony farmed 9 acres at Gibbs Hall, Kirthwaite (1861). Then by 1871 he was working as a grocer in Kirthwaite village. However, it seems they had spent some time in Liverpool in the interim, as their two oldest children had been born in the city: Anthony jnr. in 1865 and Elizabeth, in 1867. They were back in Dent when their two youngest were born: Agnes, in 1869, and John, in 1870. Nevertheless, the lure of the city proved to be too great, and by 1881 the family had relocated to the outskirts of Liverpool, where Anthony was farming 9 acres at 12 TOWN ROW, West Derby. Then, by 1891, he was a cowkeeper proper, living at 69 BOSTOCK STREET. Both Isabella and Anthony spent the rest of their lives in the city. Mary married JOHN GREENBANK (b. 1843) in 1865, in Dent. The couple immediately moved to Liverpool, where their first child, John William, was born, in 1866. John William was followed by Leonard Burton (b. 1867) and then by Richard (b. 1869), both born in Liverpool. In 1871 they were keeping cows at 56 BYFORD STREET. Sadly, Mary died in 1877, at the age of thirty. John relocated to Cumberland where he eventually re-married. However, their son, RICHARD GREENBANK (1869-1912), would return to Liverpool. After marrying Eleanor Ward, in Sedbergh, in 1891, he spent some time as a steel worker in Workington. But, by 1911 he had taken over the dairy formerly run by his parents, at 56 BYFORD STREET. Both Richard and Eleanor and all three of their children, remained in Liverpool. Richard married AGNES CHAPMAN (1857-1913) in 1877, in Dent. They spent the early part of their marriage farming in and around the Dent area. It would appear that they were in Liverpool by 1887 as that is where their 7-year-old son, George, died. By the time of the 1891 census, Richard and Agnes were keeping cows at 33/35 REYNOLDS STREET. Living with them were their sons William (13) and John (9) together with their niece, Agnes Fawcett (23). By 1901 they were keeping cows at 10 MARMONDE STREET. As well as their sons John (19) and Anthony (10), living with them was also their oldest son, William along with his wife and daughter. William had married Elizabeth Bushell (1876-1917) in 1900 and their first child was christened Agnes. When Richard died in 1902 and then Agnes, in 1913, their son, William, succeeded them in the cowkeeping business. By 1911 he was keeping cows at 6/8 HUTCHINSON STREET, along with his wife, six children and three in-laws! When William died, in 1944, the executor of his estate was his only son, WILLIAM RICHARD SEDGWICK – also a cowkeeper. The Masons are related to the Harpers through the marriage of Sarah Jane Mason to Rowland Harper. Sarah was one of eight children of Thomas Mason (1825-1901) and Jane Lambert (1831-1917), both of Sedbergh. Her brother, Lawrence, and her sister, Agnes, also relocated to Liverpool - or, more specifically, to Garston - and became cowkeepers. Lawrence married MARY JACKSON (1856-1938) in Sedbergh in 1875. They had four children, all born in Sedbergh between 1878 and 1881. Their move to Liverpool took place some time between 1891 and 1895. Lawrence is recorded in the 1895 Kelly’s Directory of Lancashire as being a Dairyman at 60 CHAPEL ROAD, Garston. This is where he raised his family and spent his entire cowkeeping life. A highlight of his cowkeeping career came in 1899, when he won first prize for best fat cow (not exceeding 14cwt) at the Liverpool Cowkeepers’ Association annual show. By 1926 he had retired and had handed over the Chapel Road business to his sons to run. He spent his retirement in the rural village of Cronton, where he died in 1934. Two of his sons, THOMAS JAMES MASON (b. 1878) and RICHARD JACKSON MASON (1884-1933), also became cowkeepers. In 1901, Thomas married SARAH ANN LEVITT, and in 1906, Richard married AGNES MILLAKIN. By the time of the 1911 census, both brothers were still in Garston. 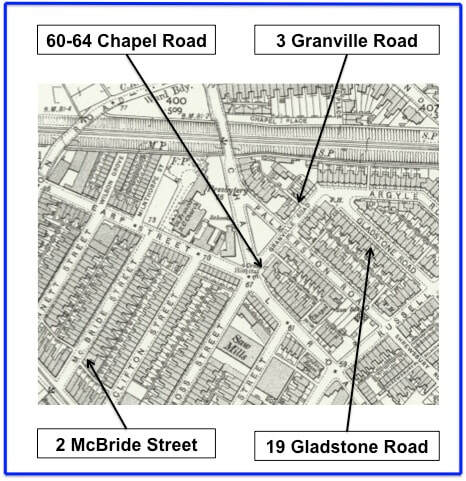 Thomas and his family were keeping cows at 2 McBRIDE STREET, whilst Richard (recorded as Jackson Mason) and his family were living at 19 Gladstone Road. The Gladstone Road property is unlikely to have been used for keeping cows due to its mid-terrace situation. However, Richard’s given occupation of ‘Dairyman Worker’ suggests he may have been working for his father at the nearby dairy in Chapel Road. Indeed, he is recorded in the 1926 directory as being a Dairyman at 60 Chapel Road and this address is also given as his place of abode when he died in 1933. It seems his widow, Agnes, continued with the business as she is recorded at this same address in 1939, living with her children; her occupation is given as ‘Dairy Farmer’. In 1881, Agnes married JOHN RICHARDSON (1854-1916), in Sedbergh. They had five daughters, all born in Sedbergh between 1883 and 1891: Jane, Agnes, Margaret, Sarah and Isabel. The family were in Liverpool for the 1901 census, keeping cows at 3 GRANVILLE ROAD, Garston, though at that time their eldest daughter, Jane (18), was working for her uncle, Rowland Harper, at 52 CHESTNUT GROVE. By the time of the 1911 census, John was a widower, Agnes having passed away in 1910. He and his younger four daughters had moved round the corner to 64 CHAPEL ROAD, Garston. His occupation is still that of Cowkeeper and it is possible that he was sharing a herd with his brother-in-law, Lawrence Mason, as the shippon ran to the rear of both 60 and 64 Chapel Road. Indeed, when John died, in 1916, probate went to Lawrence Mason, farmer. The family business was continued by John’s daughter, MARGARET MASON, who is listed as ‘Dairyman’ at 64 CHAPEL ROAD in Kelly’s (Gore’s) 1926 Directory of Liverpool. This cowkeeping dynasty has encompassed nearly fifty Liverpool properties were cows were kept. Though many of these have now gone, some are still in existence. Using the wonderful tool that is Google Street View, I've captured images of a handful of these, below. (All images are copyright of Google.) Plus, a couple of shots of Valley Fields, courtesy of Ann Heath.